The Cole-Parmer Masterflex Console Drive provides you with an easy to use, flexible, analog pump solution with precise control that can be operated remotely. This peristaltic pump has a turn knob with 10 positions and a locking lever that give you accurate speed and control making it an ideal choice for metering, or transfer applications. Because this console drive is analog, settings are preserved even when the pump is turned off. This L/S variable-speed drive has a speed range of 6 to 600 rpm, and a flow rate of between .36-3400 mL/Min, with a reversible motor and a soft start. The 1/10 hp motor provides you with smooth pulse free operation, and 2% speed control. The DB9 female connector on the back of this console drive lets you connect remotely for 4 to 20 mA, or 2 to 10 VDC speed control input as well as start/stop via open collector or contact closure. 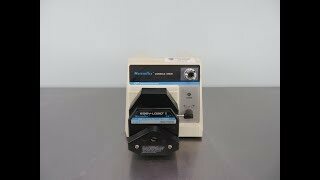 The Masterflex Console Drive Peristaltic Pump is also compatible with Standard,Easy Load, Easy-Load II, Quick Load, High-Performance, Cartridge, PTFE-Tubing, PTFE-Diaphragm heads. This Masterflex Console Drive Peristaltic Pump has been fully inspected and is performing without issue. All of our lab equipment comes backed with our standard warranty. Should you have any questions, please don't hesitate to contact us.